← Photo of the Week: Phoenix from the Air. 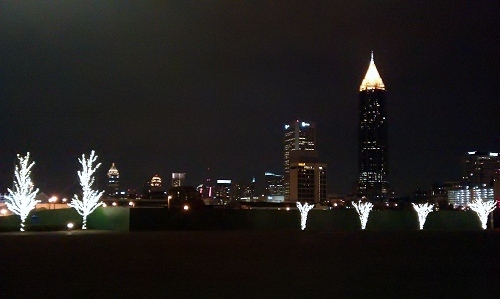 Atlanta: A Quick Holiday Stroll. Around Thanksgiving in the United States is when you’ll start to hear holiday music and see holiday lights and trees go up in earnest. 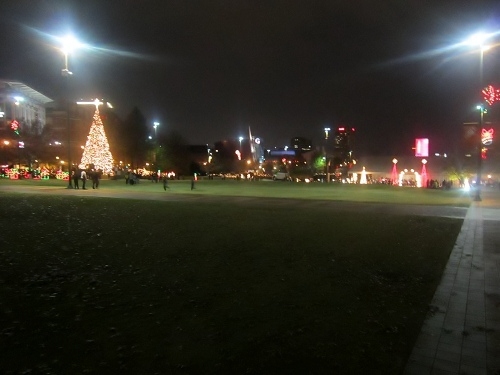 During the holiday weekend just before dark I decided to checkout the scene at one of my favorite areas in Atlanta, Pemberton Place and Centennial Olympic Park. 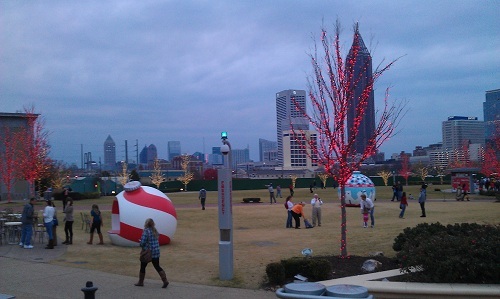 Walking onto the heart of Pemberton Place I immediately saw all the enlarged ornaments around the World of Coca-Cola. Midtown straight ahead. In how many languages can you say Merry Christmas?! A broader view of Pemberton Place. Lot’s of people were sitting and posing for pictures in the red-and-white striped ornament. Others just hanging out, having fun on the grass. The holiday lights and ornaments provided one scenic shot after another. 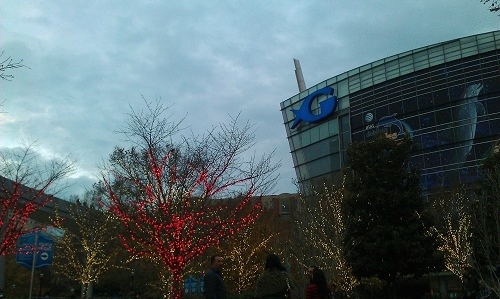 Lights dotted the landscape in front of the Georgia Aquarium. 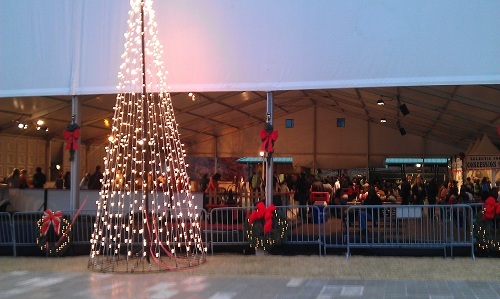 …and the outdoor ice skating opportunities. Lot’s of people, families and out-of-towners having fun. I made sure to hang around until dark to see the tree and 20-miles of lights within the park lit up against the sky. What about checking out the tree from way up in that dark sky? You bet. Seventy-three stories up I went to be exact. View from The Sun Dial Restaurant Bar & View up-top the Westin Peachtree Plaza Hotel. I’m not going to let night skyline shot opportunities pass me by. 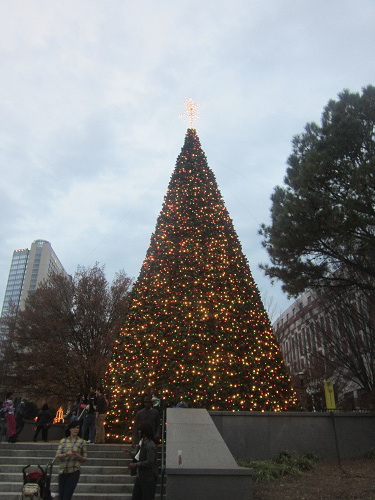 It was a quick, fun holiday stroll in the ATL. 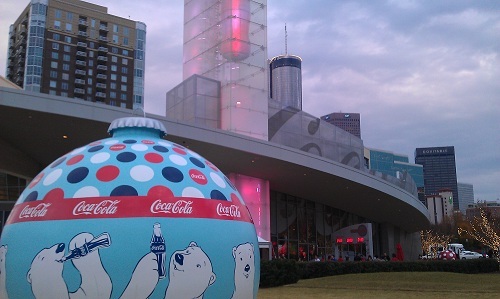 If your ever in Atlanta this time of year, make sure to checkout the lights and fun in this neck of the woods as well as the Georgia Aquarium and the World of Coca-Cola. 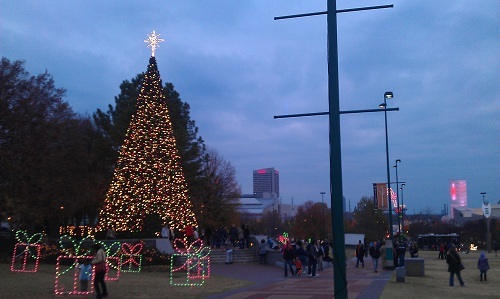 Where’s a good spot to checkout the holiday scene in your hometown? That you have come across in your travels? 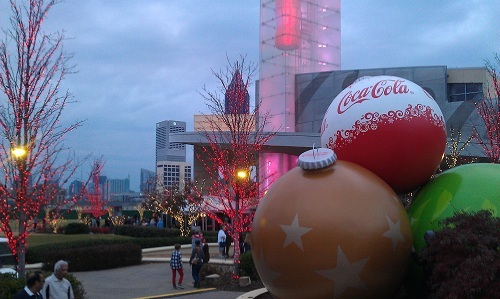 This entry was posted in Atlanta, Georgia, travel and tagged ATL, Atlanta, Coca-Cola, Georgia, holidays, park, skyline. Bookmark the permalink. Great post! Would you mind if I reposted this on my travel blog (CourtneyMara.com)? I would obviously give you full credit and have it link to your site? Thanks for sharing your trip! 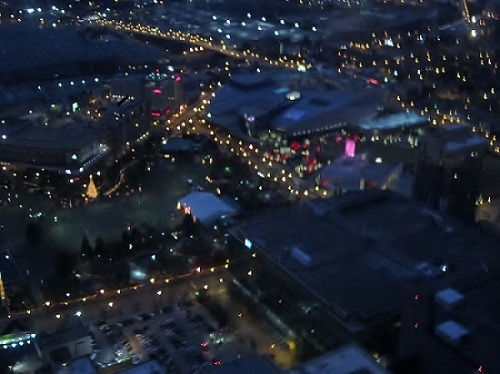 I’ve been to one hotel based rotating restaurant high above Atlanta, but that was back in the early ’70s, and I don’t believe it was the Peachtree Plaza. Great vantage point from which to take photographs. 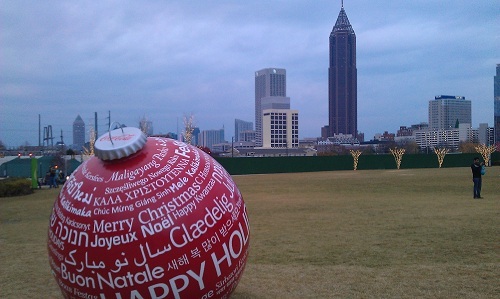 Great post about the holidays in Atlanta by elatlboy! Check out more great posts by elatlboy at http://elatlboy.com!